While most YA books are extremely satisfactory to not-so-young adults, is it the same for YA SF short stories? I'll take you story-by-story through this collection. Percy Jackson and the Singer of Apollo by Rick Riordan is a short story in which Percy gets up to his usual shenanigans. Bamboozled by Apollo into recovering his missing Singer, Percy and Grover race to save New York from certain doom at the Singer's ... vocal cords. Like a short episode from any of the Percy Jackson books. Bouncing the Grinning Goat by Shannon Hale is about a teen girl who joins the Grinning Goat inn as a bouncer under false pretences, but makes it all work in the end. One of the best stories in the book. The Scout by DJ McHale is about a young Scout who's not too interested in following the scripted desert trek prescribed by the Scout Leader. He is attacked by an alien device. Is it the precursor to an invasion of the world? A completely unexpected ending. I liked this story quite a bit. Rise of the RoboShoes TM by Tom Engleberger is an illustrated story. The illustrations are like someone who just learned to use MS Paint would do. The story is not much better. This may go down okay with the 10-12 year-old crowd, but maybe not. Not the best story in the book. The Dirt on Our Shoes by Neal Shusterman is about a generation ship which is soon due to make planetfall. Some of the kids on the ship are better students, less questioning, more privileged. Some are barely surviving, and struggle to eat enough, let alone be able to afford luxuries like bathing water. Which of them is going to be the ones needed on the new colony? Slightly predictable for non-young-adult readers. Plan Bby Rebecca Stead had me scratching my head to get to understand what was going on, but the denouement was quite a surprise. A Day in the Life by Shaun Tan is a graphic story aka comic. Reasonably well drawn, but not such a great plot. Again, not the best story in the book. The Klack Bros Museum by Kenneth Oppel is a new take on ghost stories. Very nicely done atmosphere and tension. And a surprising end. Very satisfying. The Warlords of Recess by Eric Nylund is a light story about cunning empire-builders who take over planets based on Rules which they follow rigorously, and to the detriment of the taken-over. They meet their match in a high school playground during recess. Fair, but slightly writing-down-to-kids type stuff. Say, of the style of the Spy Kids movies. Frost and Fire by Ray Bradbury rounds off the book. It's about a planet where the days are super short, and the weather is super dangerous. Humans there have evolved to match the planet. People live only for a week. The hero and heroine of the piece try to save the people by attempting to reach the old lander, where things would presumably be better. A really old style Bradbury story. People would classify this as pure fantasy today, but back then when it was written, it was viable SF. A fairly good read, if not a fully satisfactory end. Why did they leave most of the people in the bad situation, I keep wondering. 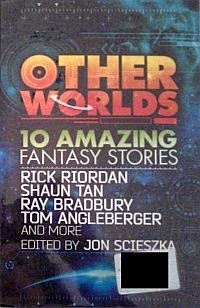 All in all, a fair sampling of mostly good stories in SF and fantasy for young readers. So, last review I said I'd tell you about a coincidence. The last book had a protagonist named Rylee, and this one has a protagonist named Riley. How's that for coincidence between two YA thrillers? Oh, so the title says YA SF? Big deal. Can't an SF book be a thriller? Usually, they all are. Thrilling, I mean. Let's get on with it. Riley is an orphan from Victorian London. Chevie aka Chevron, is a teen FBI agent (it's an experiment by the FBI, being abandoned). How do they meet, you wonder. Not so tough. The FBI has a top secret program called WARP, in which witness protection is done by hiding the witnesses in the past. Chevie, in some kind of disgrace for saving some people she was watching over (yeah, yeah, you know how it goes), is sent to London to mind the WARP machine, but not told by Agent Orange what it's all about. (Please groan along with me if you get the Agent Orange reference, since we soon enough find that's not his real name). Just to get some things sorted out for you, Agent Orange's dad invented WARP, and is sulking in the past, along with the timekey. Which means nobody else can go to the past, and the people there are stuck. Now, someone wants to assassinate the dad, and pays our friend, the evil villain Albert Garrick, to do so. Albert in turn wants Riley to do so. Somewhere in the process, Riley tumbles out in our century. Garrick, an erstwhile stage magician and enthusiastic assassin, realises that something is afoot and he can gain power, maybe even rule the world (muwahahahahaha!) Somewhere in the transfer when Garrick hits our century, he gets super powers as well as a lot of information about the present. (Not telling you how; that would be a spoiler). So, you have a story with a supervillain, and ordinary teenaged heroes, each with his or her own weaknesses and strengths. Eoin Colfer never promises a smooth ride, or even a happy ending. The process of beating the villain is complex, nail-biting, and never to be taken for granted. You may even find that the villain is not fully beaten, but only a temporary truce has been formed. Other villains pop up and help or hinder, depending on their own needs and outlooks. 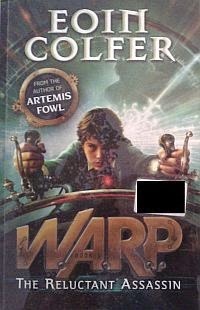 If you liked the Artemis Fowl books and The Airman, the chances are good you'll like WARP. There's more historical reference and less fantasy in WARP than in Artemis Fowl, and more fantasy and less historical reference than in The Airman. Just so you know. The resident teen wanted to know why I read YA books instead of 'normal adult' books. Are they better? You bet they are! RUN features a protagonist named Rylee. I'll come to this in the next review, under the heading 'coincidences'. Rylee has been on the run from since she can remember. Every now and then, her paranoid mother (not really, in case someone is really out to get you, are you still paranoid?) will uproot the whole family, stepfather, stepbrother and all, and they will change their names and city. Rylee has reached the grand old age of 16 or so, and wants to have a normal life and normal friends, like schoolmate Caleb. Who's after them? Why can't normal law enforcement keep the villain at bay? Rylee doesn't know, and nobody's telling. Till one day she reaches home to find her brother calling for her in terror. Someone has killed her stepfather, and her mother is missing. Rylee goes on the run, to save seven-year-old Hayden, and possibly her mother, too. There are clues her mother has left for her, and there are clues she finds out for herself. All the while avoiding being caught for a murder she did not do. There are so many lies she has to go through, and so many layers of lies, the book begins to look fairly onion-shaped. There are evil villains, convoluted reasons why people do the things they do, idols with feet of clay, unexpected help, serial killers, crooked cops, even facebook. What more could a young adult want? I loved the book, and would want to read more about Rylee (whose 'real' name we do find out at some stage) and her further adventures. Here is one ninja you'd want on your side: fearless, dedicated, intelligent, compassionate and a chameleon! Every girl's hero fantasy, written in a pacy, no-nonsense first-person style that is so very believable and true to the character.